Who was Lady Llanover, the 'Bee of Gwent'? Lady Llanover (1802-1896) was one of the most important female contributors to the nineteenth century Welsh cultural revival. She was also one of it’s most fascinating characters. The purpose of this book is to encourage further exploration of Gwenynen Gwent, her complex identity and life’s work of creating a sanctuary for her version of Welsh culture. 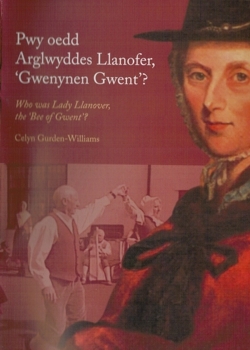 It is a pleasure to write the foreword to ‘Who was Lady Llanover, the Bee of Gwent?”, by Celyn Gurden-Williams. I first met Celyn in 2007 when she wrote her fascinating postgraduate thesis “ Lady Llanover and the Creation of a Welsh Cultural Utopia”. Living at Llanover, I am surrounded by reminders of my great-great-great -great grandmothers determination to keep alive the culture and traditions of Wales. With the use of contemporaneous quotes Celyn has written a very informative and entertaining booklet. In it she describes Lady Llanover’s determination to promote the Welsh language, costume, music and customs among her friends, tenants and servants during the nineteenth century, when the rest of South Wales was turning towards English as their first language and foreign imports such as Indian cotton and the Italian pedal harp. I hope that you are as intrigued a28-08-2016am of Welshness and the reactions which she provoked.